Political correctness, fears of mass corruption in the Establishment, the gap between rich and poor, sports role models, the Olympic legacy and multiculturalism. The competition saw the teams from St John Lloyd and Bryngwyn take the senior and intermediate prizes to progress to the next round of the Rotary competition – a zone area final. The Youth Speaks competition is organised on a national basis and it is possible for the teams to win through to a UK final. A 'Noson Joio' fun night is being held at Carmarthen Town AFC's clubhouse next month. The poems and pints and live music night will be held at Richmond Park at 7.30pm on Friday, February 15. The evening will feature three celebrated Welsh actors - Dafydd Hywel, Sue Roderick and Dewi 'Pws' Morris. Proceeds will go towards Speaking Books Wales and the Football Community Programme at Carmarthen Town. Tickets available from - Gareth O Jones 0781 426 2656; Jeff Thomas 0781 369 7774. Tributes have been paid to a longstanding Llanelli business owner. Denis Bates, who was best known for his Morfa store 'Bates the Shop', died suddenly but peacefully at the age of 84 in Morriston Hospital on January 18. Côr Meibion Llanelli members were hoping to sing at his funeral service today. "Denis was a very popular member of the choir during his time with Côr Meibion Llanelli," said choir secretary Fred Elias. "Always enthusiastic and passionate about his singing, he will be sorely missed." Former Star editor Robert Lloyd said he had fond memories of working with Denis on the publication of his account of walking the Oregon Trail in the USA. "His entertaining stories of that walk were featured in the columns of the Llanelli Star," he said. "He was a character and a gentleman with a great sense of humour." The St Elli Shopping Centre, the trading hub of Llanelli, is moving into the fast lane. The centre is to have an innovative mini car showroom featuring cars from Sinclair Volkswagen Swansea. “It’s something of a novelty when it comes to what we offer as a shopping centre,” said centre manager Andrew Stephens. “It’s very different to our more customary ‘shop’ operations, but Sinclair Volkswagen Swansea were keen on the unit and we think it brings something new and fresh to the shopping centre. “What is interesting is that there are companies out there willing and prepared to invest in Llanelli. “You get all this doom and gloom talk on occasions about Llanelli town centre as a shopping destination, but the High Street and the shopping experience is changing all the time. “It’s good news for the St Elli Shopping Centre that Sinclair Volkswagen Swansea are coming to town – and they are likely to be followed very quickly by another new tenant at our shopping centre. Llanelli Constituency Labour Party (CLP) will be holding a Quiz Night at the Queen Victoria Club (next door to the MP's office in Queen Victoria Road) on Thursday 31st January, 7pm. £1 per person, groups welcome! Put your thinking caps on, come along and enjoy a good night out and support your CLP - all proceeds go to Llanelli CLP funds. Phone Suzy Curry for further details 0756 1566 456. 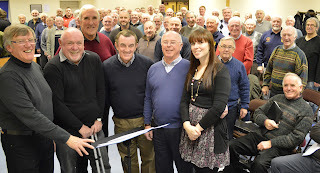 Côr Meibion Llanelli members have been busy rehearsing a new ‘battle hymn’ for the British and Irish Lions rugby team. And the new version of ‘Men of Harlech’ has received the thumbs-up from two Lions legends, Delme Thomas and Phil Bennett. The rugby heroes were on hand to hear the unofficial ‘premiere’ of ‘Lions To A Man’, a poem set to the Men of Harlech tune. “I’m a big fan of Côr Meibion Llanelli and I love listening to them,” said the hero of Llanelli’s famous 9-3 win over New Zealand Delme Thomas. “This new song is very stirring and I am sure people will love it. The plan is to record ‘Lions To A Man’ and video the recording session. There will be a full edit of the film for You Tube on the internet and the tune will be available for downloads on the iTunes and Android platforms on computers and mobile devices. British hop growers and brewers gathered at Stocks Farm in Worcestershire for the unveiling of the results of the Institute of Brewing and Distilling’s annual British Hop Competition for the 2012 crop. The competition dates back to 1944 and is judged by a panel of Master Brewers who draw on their personal experience as Head Brewers to judge the quality of the hops. A total of 122 samples from the 2012 harvest were submitted to the competition by 45 growers from across Britain. 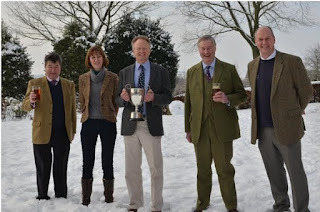 The overall champion was a sample of Fuggle hops grown by James Rickard of Rickards Farm in Canterbury, Kent. The award was presented by Mark Woodhouse, Chairman of Hall and Woodhouse and Master of the Worshipful Company of Brewers. Full details of all the winners are listed below. Cardigan Stakeholder Board have welcomed the land being secured and selection of design team and external support consultants as a major step forward for delivery of an integrated health and social care facility. The Stakeholder Board met recently to discuss progress and the meeting was well-attended by representatives of a wide range of organisations and groups with an interest in the project. The Project Board has interviewed and notified the successful support consultants (via the ‘Designed for Life 3’ Building for Wales Framework). They are; a project manager and cost advisor, from Gardiner and Theobald; Supply Chain Partner, Balfour Beattie; and ‘Fusion’ Healthcare Planners whose role will be to collate all information for the Outline Business Case for submission to the Welsh Government later this year. Just back from a pleasant lunch as the guest speaker at Carmarthen Rotary Club's meeting at the Ivy Bush Royal Hotel, Carmarthen. The talk was on my role as a 'Games Maker' at the London 2012 Olympics and Paralympics. The vote of thanks was given by Jeff Thomas. 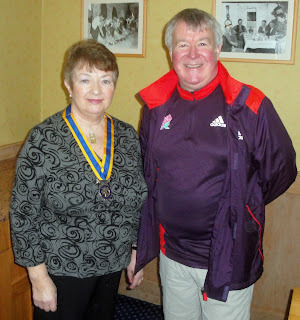 Pictured with Carmarthen Rotary Club President Mrs Barbara Rumbold. 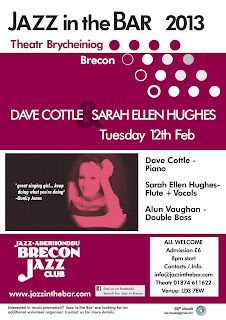 with Alun Vaughan on double bass. Jazz piano and rhythm section, flute and classy lead vocals. A Valentine's Ball is being held by the Llanelli Branch of the British Heart Foundation and Llanelli Coronary Care Unit. It is on Saturday, February 9, at the Stradey Park Hotel, Llanelli. The cost is £30 per head and includes a welcome drink, lavish three-course meal and coffee, with live entertainment from Mojo's Soul band.